With an average snow base of more than 4 meters per year, combined with runs as long as 7km which flow with the mountains natural form, Hakkoda offers skiers a thrilling, deep powder experience. 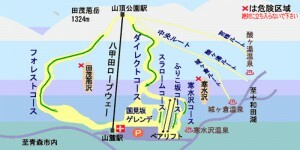 The resort features 5 courses; 3 groomed and 2 ungroomed, however like Asahidake (LINK) the field consists of a single ropeway and is more a powder mountain than a proper resort. The area is made up of a series of eight mountains and is known for its backcountry powder ski and snowboard potential, as well as its high volume of snowfall and little crowding. Hakkoda also features the unique “Snow Monsters” forming a breathtaking scenic backdrop and is only one of a handful of mountains which produce this feature. If you plan on going off-piste we highly-recommend you take a guided tour first. The nearby Jogakura Hotel, as well as providing quality accommodation, offers tours with highly experienced guides alongside full gear rental facilities. Due to its isolated location nightlife in the area is relatively minimal, with access to Aomori City dependent on time and weather. The small town of Kuroishi to the west may offer some hope as a classic example of a Japanese country town, just an hour’s drive away. 1) Changes to weather conditions in the Hakkoda area can be sudden and severe in both winter and spring seasons. Please do not head into the mountains without full protective gear and equipment and unless you are accompanied by a proficient guide/experienced leader. 2) In the unlikely event of an accident, you should have the following things with you: protective clothing, emergency food and water, route map, compass, first aid supplies and materials for on-the-spot equipment repairs. 3) Stay with a group and do not ski alone. 4) Temperatures can drop as low as -10 Celsius, even in April, and winds can be two or three times stronger than at lower elevations. Please be weary and avoid any reckless behavior. To get to Aomori from Tokyo, take the JR Tohoku Shinkansen to Shin-Aomori Station; this will take you about 3 hours. From Shin-Aomori Station it is a 45-50 drive to Sanroku Ropeway Station at the base of Hakkoda, or a 60 minute ride with the JR Tohoku Bus. 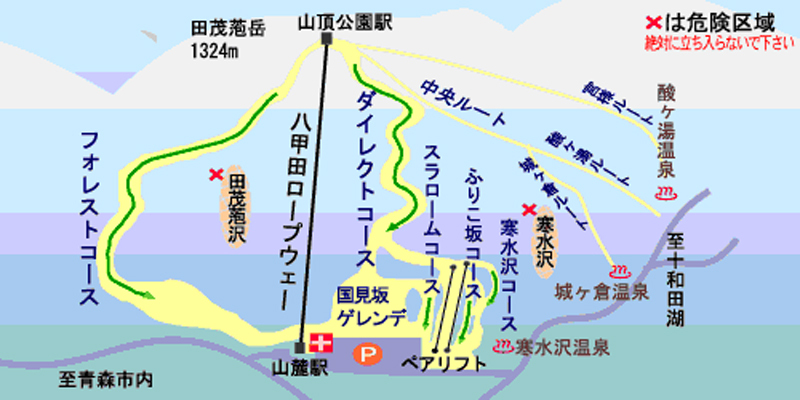 For those travelling from Aomori Airport it is about a 45 minute drive or taxi ride. *During the winter season the road linking Aomori City and Hakkoda is closed between 9PM and 7:30AM due to the often heavy snowfall. Times may vary depending on weather conditions. The Hotel Jogakura stands in the middle of Mt. 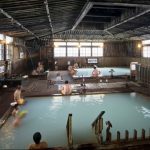 Hakkoda and provides a mountain resort accommodation boasting natural hot springs, saunas and gorgeous Japanese meals. The hotel is also catered for skiers and snowboarders, being fully equipped with gear rental services and backcountry tours options for those looking for a winter adventure. The hotel is ideal for visitors during any season with easy access to surrounding natural features and shuttle buses which run to and from attractions including Hakkoda Ropeway, as well as to Aomori Station and Aomori Airport. 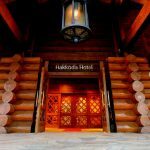 Hakkoda Hotel is surrounded by the old-growth forest of Hakkoda, a genuine resort hotel featuring thick-cut, dignified log construction. 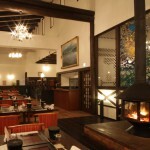 Guests can choose from original French or Japanese cuisine made from fresh and seasonal natural ingredients. The interior is so confortable that you will forget you are in the middle of a frigid mountain range. Sukayu Onsen Ryokan is a rare gem of traditional atmosphere and spirit that gives guests a fine feeling of nostalgia. It features classic tatami private rooms, wish communal bathrooms featuring modern Western-style wash basin. Breakfast is buffet style, and dinner is semi-buffet style.